After decades of casual recognition and collecting obscurity, the Pairpoint Fine Arts Line is emerging as one of the most desirable collecting areas of all the Pairpoint product lines. These artistically conceived and beautifully executed combinations of engraved glass and silver-plated mounts is the easiest of all the Pairpoint products to identify, but the most difficult to validate as to configuration and completeness. 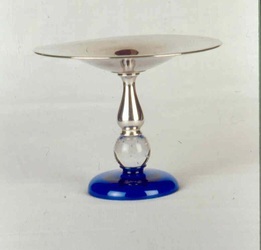 Since The Pairpoint Corporation was the single successor company to the Pairpoint Manufacturing Company, which specialized in silver-plated metal wares, and the Mt. 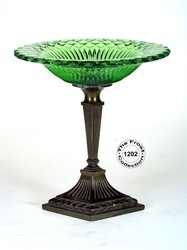 Washington Glass Company, makers of fine glass products, it was only natural that metal and glass were brought together into single beautiful designs. Every item produced as part of the Fine Arts Line was individually signed with the company name and the catalog number. Many people presume that the presence of this information makes accurate identification absolute. But, this presumption has led many dealers and collectors into making very large purchasing mistakes. 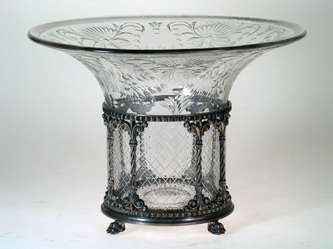 Many times illegitimate glass components are adapted to fit the legitimate (and signed) metal component because the original glass portion was lost or broken at sometime in the past. 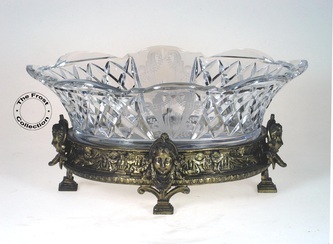 The most common and extremely prolific fraud involves the #4970 Cherub Cigarette Holder. Unlike most reference and knowledge databases, which are intended to assist the collector with identification, this section of the website is intended to be used for VALIDATION. Even with correctly configured and authentic Fine Arts Line pieces, sometimes the metal component has been altered in some way due to damage. In many cases the modifications to a metal component can be easily disguised. So… THE BOTTOM LINE is to validate your anticipated purchase before spending the significant money the Fine Arts Line items will likely cost you. Follow the product number through the database to the catalog page; what is shown is the way it is supposed to be. Keep in mind that Pairpoint may have executed the glass portion using different engraving or cutting patters, as well as colors, but the shapes will be consistent.